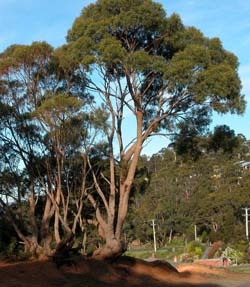 Eucalyptus amygdalina (Black Peppermint) is a peppermint-type eucalypt that is widespread in the Tasmania apart from the south-west. It grows in dry forest. The distinctive features are the combination of narrow leaves (only about 1cm wide or less) and fibrous bark running to the small branches. 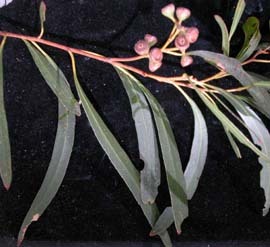 Confusing species include E. radiata, which occurs in the north-west, but which has wider leaves (~2cm), and E. rodwayi, which has 7 fruit per umbel and grows in swampy places. It is a member or the peppermint group, along with E. nitida, E. tenuiramis, E. coccifera, E. risdonii, E. pulchella and E. radiata.